If you’re tired of having the same old look in your home, you might be tempted to undergo an extensive interior remodeling project. However, you can revitalize the look of your space by simply changing what’s underfoot. Flooring is one of the first things visitors notice when they step inside of your home. If you’re looking to revamp the look and feel of your interior, turn to our dedicated specialists to make your home warmer and more inviting with premium hardwood flooring in Santa Barbara, CA. For many customers, installing prefinished hardwood flooring is a dream home improvement project. Whether you are revamping an older home or selecting floors for a new place, you are sure to find an ideal choice at our flooring showroom. We proudly showcase a vast selection of distinctive grains, colors, and textures from many of the industry’s leading names. Featuring an impressive inventory of flawless prefinished hardwood floors, you can feel confident knowing that no matter what your choice, it will stand the test of time. For homeowners who crave a timeless look, wood floors offer remarkable appeal that complements nearly any aesthetic. Available in a wide range of options, our hardwood selections can bring out the untapped inner beauty of your home. Whether you prefer to add a rustic, traditional, or contemporary look to your décor, you’ll be sure to find a suitable prefinished hardwood flooring choice in our expansive showroom. When you’re ready to lay new wood floors in your space, our dedicated professionals are here to make the selection process easy. Share your design aspirations with our sensible flooring specialists and we’ll ensure your selection perfectly meets your aesthetic and functional needs. From helping you find the perfect selection to adding the finishing touches to your interior design project, we have everything you need to bring your vision to life. 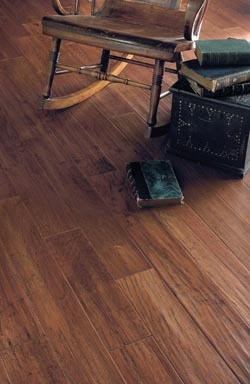 Engineered hardwood is made from multiple layers of real, natural wood that have been bonded together to form planks. All wood floors expand and shrink with changes in temperature and humidity, but engineered hardwood is designed to combat this tendency, so expansion and contraction are minimized. This characteristic means you can install it in areas that experience bigger swings in temperature and humidity, such as front porches, entryways, and even basements. The planks are also less likely to create gaps or warp over time. Add character to any room with beautiful, prefinished hardwood floors. This distinctive flooring material is highly prized by homeowners and house hunters alike. Hardwood is a strong, durable surface that’s relatively easy to maintain. It’s an excellent investment, as it will last for decades with routine maintenance and care. In addition to suggesting various types of beautiful wood floors, we provide efficient maintenance tips. You can extend the life of your hardwood flooring by using rugs for high-impact spots and areas susceptible to excessive sunshine. Installing a dehumidifier is a great way to maintain normal humidity levels, which helps prevent shrinkage and expansion. Cleaning with a damp mop is recommended for some specific types of floor, but it’s important to know that using wax or cleaners can be damaging. We’ll provide you with all of the information you need to keep your floor in excellent condition for years to come. Hardwood flooring is a great investment, and caring for your floor properly is an easy way to preserve the value of your property. Give your living room a distinctive, rustic look with hand scraped wood floors. Each plank is scraped to produce the appearance and texture of an old-fashioned floorboard. The scraping process accentuates the grain and patterns in the wood. Perfectly flat, uniform planks look great in some rooms, but scraped planks have a unique charm that will make your home stand out. Offering sales and wood floor installation services, we’re equipped to walk you through the entire process from beginning to end. When you turn to our team for a seamless hardwood flooring installation, we’ll ensure you get the look and feel you expect from your brand new floors. We install beautiful floor coverings for residential and commercial clients throughout the area. Our team has the knowledge and experience to facilitate high-quality installations every time. No matter what wood floors you choose or the size of your renovation project, we’ll ensure your selection is laid perfectly into place. Let our skilled installation crew ensure your new wood flooring selection looks and performs according to our high standards. Our prices are highly competitive, and we pride ourselves on the quality of our work. We never cut corners, and always strive to deliver the best possible results while remaining within your budget. No matter what your aesthetic preferences are, or what look you wish to achieve, our keen hardwood flooring specialists are here to help you find exactly what you need to complete your flooring project. Whatever your choice, we utilize tried-and-true installation methods to leave you with a beautiful new home addition. We understand that your home is one of your greatest assets. As a result, we consider it our obligation to treat it with the respect and care it deserves. Rely on our dedicated hardwood flooring specialists to help you find the option that best suits your needs in looks, performance, and price. Don’t hesitate to get in touch if you have any questions or concerns about the installation process. Contact our specialists to learn more about our hardwood flooring options. We proudly serve homeowners in Santa Barbara, Isla Vista, Mission Canyon, Montecito, and Summerland, California, as well as the surrounding areas.